Listening to the words of Surpanakha, the lusty passion of Ravana was aroused, and he became the bond-slave or ruinous foolishness; he wriggled out of the feelings of hatred towards Rama and Lakshmana and started planning stratagems to bring Sita away from their presence. He sank in thought and was plunged into anxiety and restlessness, without any effort to quench hunger or thirst. Such was the fatal fascination that haunted him. While Surpanakha was describing the beauty and splendour of the brothers, Rama and Lakshmana, there was one person in the Audience Hall, Vibhishana, who gave ear to the story with joy in the heart and tears in his eyes. He installed those Divinely charming figures in the temple of his heart and yearned deeply for the chance of being in their Presence and falling at their feet. "Will they receive me? Can I be saved? Do I deserve to be blessed by them? ", he asked himself. He told himself: "They are Divine, for certain. They have appeared on earth in human form, in order to destroy the wicked brood of Rakshasas". He offered in his mind all that he had and was; he began living in the constant meditation of their glory from that very moment. Meanwhile, since his body and mind had grown out of Rakshasa urges and developed with the help of demonic sustenance, he ignored the Divine in him, which was calling for merger in the Divine Rama. He relied on his Rakshasa nature and awakened its sinister possibilities and powers. The Divine and the Demonic facets of his personality rose and sank alternately, moment after moment. So, he convinced himself at last that the two brothers were Royal Princes and no more; he resolved that he would kill them both and bring away the lady, of whom he was so enamoured. He promised his sister that he would avenge the injury inflicted on her in that manner. He announced that the Assembly was adjourned; he ordered his aides to bring to the Audience Hall the imperial chariot for his journey. He took his seat in the chariot with no companion beside him. He hurried to the 'sea-shore dwelling' of Maricha, and sat by his side, detailing to him the events that had happened. He ordered Maricha to play his part in the execution of his plan. But, Maricha said that he had borne the brunt of the might of both Rama and Lakshmana, once already. [see also: Ramakatha Rasavahini, part 1, Chapter 6(b)] He told Ravana that they are not of the common run of Princes; he advised him against such wild enterprises. He argued long and lovingly with Ravana, to dissuade him. But, passion had made Ravana blind to the dictates of duty and morality. So, he threatened to punish Maricha, if he did not yield to his will. Maricha decided within himself that it was better to die at the hands of Rama than of the Rakshasa that Ravana was. He agreed to the proposal that Ravana laid before him, and got ready to play his part in the conspiracy. Ravana proceeded to the Dandaka Forest, with Maricha following him close. On the way, Ravana explained to his companion the strategy he had conceived. He directed Maricha to transform himself, by means of his demonic powers, into a lovely golden deer. He wanted him to frisk about, in that alluring form, before the hermitage where Rama, Sita and Lakshmana were. Maricha had to assent, since he had no way of escaping from his ire. Ravana told him: "Rama will try to capture you, and will follow you and you should lead him far into the distance, and from thence, you must yell in painful agony, 'O Sita! O Lakshmana', in a voice exactly like that of Rama". Then, keeping the chariot afar, both moved towards the hermitage. While this web was being woven, at the hermitage in Panchavati Sita and Rama suddenly felt that the moment of fulfillment of their task had come. Rama sent Lakshmana to collect tubers and fruits for the day. And, noting that the proper hour had come, he told Sita thus: "Companion! You know all. Both of us are aware why we have come on earth, and what our task is. That task is now calling us; we have to enter upon it, in right earnest now. Your nature and characteristics are noble and holy beyond measure. We both have assumed these human bodies, through rites associated with the Fire Principle. My body arose from the Offering brought out of the flames of the sacrificial Fire by the God Agni Himself. [See also: Ramakatha Rasavahini Chapter 3] You rose from the earth that was furrowed by the sacred plough in order to consecrate it for a Fire-Altar, where a Yajna had to be performed. [See also: Ramakatha Rasavahini Chapter 7(c)] Our bodies are born in fire and are being sustained by the warmth of fire. Therefore, Sita, deposit all your Divine attributes and splendour in Fire, and act as an ordinary human being hereafter. I too shall move and act as an ordinary human being, and exhibit sorrow and anxiety on your account, the pangs of separation and the pain of loneliness. The world would keep in mind only these modes of behaviour, and take us as human. They will accept them as worldly conduct and natural reaction. Remember that the smallest act of ours has to be an ideal for the householders of the world. We have to hold forth models in the relationship between the husband and the wife; they have to be quite in consonance with the principles of Truth and Righteousness. Our activities have to be in conformity with the guidelines laid down in the Sastras, the spiritual texts. We have to shape our lives, in an exemplary manner, so that common men can be inspired thereby and prompted to follow the ideals elaborated therein. We have to enact this drama until the final consummation, namely, the destruction of Ravana and the Rakshasas. "Therefore place your Divine Splendour in the keeping of the God of Fire, Agni, and move about as an ordinary woman caught in the coils of illusion, Maya. For, there can be no effect without a cause. We must consummate the effect, namely, the destruction of Ravana and the Rakshasa brood. So, we must manipulate a cause to justify it or bring it about. Ravana has a basic fault in his structure, namely, his lustful passion. We have to highlight it before the world. So, we have to so prepare such a situation that it would appear as if he kidnaps you in a fit of passion. The world has to realize that his 'dedication and devotion to God' are not of the highest order, for, of what use is that sense of surrender if it is tarnished by the craving for sensual pleasure and immoral yearning? Activities and behaviour emanating from a consciousness that is not pure are tarnished; the devotion to God that is polluted by lust is as foul as dirt - these truths have to be emphasized now, for the benefit of mankind. "It is also imperative to announce for the benefit of mankind that any spiritual sadhana or asceticism, or religious rite or ritual undertaken with the intention of gaining super human powers are paltry and pernicious. We have to hold forth Ravana as a warning to mankind that however many divine rites and acts one may do, if one does not give up one's demonic passions and impulses, they add up to only one result: rendering them unholy and sterile. "Over and above all this, Sita, there is one overwhelming consideration we have to place before ourselves. There is a curse that has been pronounced on Ravana and he has also been assured of a means by which he could end its consequence. We have to see that the means is fulfilled. The beginning of his end has arrived. Today or tomorrow, we have to be separated from each other. Of course, we are inseparable entities and nothing can keep us apart. Yet, we have to pretend that it has happened, in order to render the make-believe effective. Go now, and deposit your Divine Form in the keeping of Agni (Fire). It is time for Lakshmana to return with the fruits and tubers. And, Ravana is ready with his perverted intelligence. "I have to inform you of another secret too. You have to perform your part in the destruction of the Rakshasas. Though you might be apparently under the surveillance of Ravana, since your Power is immanent in Fire, you will have to burn Lanka to ashes emerging from the Fire where your Self is dormant from now on. Lanka has to be turned to ashes, not by Fire, but, by you as Fire. And, Rama has to kill Ravana; that is the Divine Will. This truth has to be proclaimed. This mystery is to be kept from Lakshmana also. He is our instrument in this endeavour. When this task is accomplished and we have to re-enter Ayodhya, I shall accept you again from the Fire where you reside. That act too I will transform into a lesson for the world. The drama starts now," Rama said. Both Sita and Rama decided on their plan of action and awaited the unfoldment of Ravana's strategy. From that moment, every act and behaviour of Sita and Rama, the pangs of separation, the gasps of anxiety, the sighs of pain, the groans of grief - were gestures and reactions in the drama decided upon. They were not genuine at all. For, how can Sita and Rama ever be separated? Through their conduct, they only willed to reach mankind some valuable lessons. At this moment, Lakshmana made his entrance, with his hands full of fruits and other eatables. They partook of the simple meal and drank the cool limpid water of the river nearby. Then, they sat, admiring the charming landscape and bringing to mind the atrocities of the Rakshasas which fouled the peaceful atmosphere of the forests. They talked exultingly about the sweetness and sanctity of sylvan life. Not far from them, Ravana and Maricha were arguing how best to enter the hermitage to execute their nefarious design. Maricha was disgusted at the passion and perversity of Ravana; but, he did not have the courage to deny him his own complicity. He had no inclination to die at the hands of such a wicked person; so, he accepted the role Ravana granted him and agreed to do as he wanted. Maricha changed his form into a fascinating golden deer, a form that was certain to attract the admiration of Sita and Rama. He thought within himself: "Ah! What an auspicious day is this that has dawned! I am about to be blessed in a few moments with the vision of the three most charming individuals on earth! On me will fall the looks of Sita. 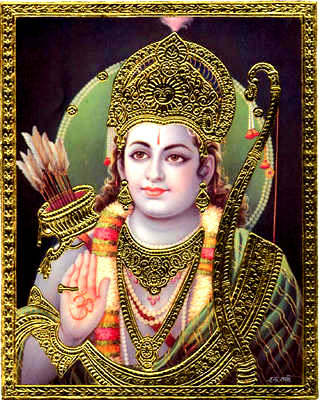 And, then, ah, Rama will follow me, with bow and arrow in hand. Ah! How fortunate am I! I am the servant, who has to tread on the footsteps of Rama; but, my Master will follow me now. Of course, I know that I am engaged in a most heinous act; but, I am forced into it; I do not act according to my will. I am being forced into it, and so, I am free from sin. Whatever sin I have perpetrated, when Rama's arrow shot by Rama's hand strikes me, this artificial form will disappear; that will be my happy destiny. Can all people aspire for such an end, can all people achieve it? And, I will have another piece of good fortune. When I draw my last breath, my eyes will be fixed on Rama! That Divine Beauty will be in front of me; the sweet Name will be on my tongue! Ah! How fruitful has my life become! I do not find any one luckier than I". Maricha dwelt on these sweet thoughts, as he walked slowly towards the hermitage. The all-knowing Rama and the all-knowing Sita were both awaiting his appearance. The deer approached hesitatingly and with evident trepidation the precincts of the cottage. It fixed its looks on Sita and Rama and stood for a while; then, it frisked and skipped a few paces and peering into a bush of creepers, it entered it out of sheer curiosity, only to come out of it in a trice. Sita, Rama and Lakshmana noticed its antics and admired its appearance; seeing that it had a golden skin, they decided that it was a strange species of deer. They noticed its special characteristics and were fascinated by its charm. Sita said, "If only I could have this deer with me, I could spend time happily in its company. When you two are engaged in things concerning you alone, I could be happy playing with this unique pet. Please catch this bright little animal for me. Can you not fulfill this tiny wish of mine, so that I can entertain myself when alone, fondling it and watching it play about?" Sita appealed thus, exhibiting great attachment to the mysterious deer. Noticing this, Lakshmana rose from his seat, saying "Mother! I shall get it for you". Rama stopped him. He knew that 'it will fall only into his own hands'. Lakshmana did not know the drama that was being enacted with this as the prologue. He said, "Lakshmana! It has to be caught, without inflicting any wound or injury. So, I have myself to pursue it and catch it. I have myself to fulfill this wish of Sita". At this, Lakshmana was silenced and he sat down, as directed by Rama. Moreover, since the subsequent scenes of the drama were known to both Sita and Rama, Rama kept it to himself, while he said: "Lakshmana! This forest is the dwelling place of Rakshasas. Remember what happened two days ago, when their leaders, Khara and Dushana fell upon us. Their kinsmen and comrades might come in force and attack us. So, it is necessary to have arrow on bow always and watch all the four quarters with utmost alertness. Guard Sita with great care. Do not leave Sita alone, under any circumstance. This deer might escape me and flee into the distance. I have to catch it alive; so, it may take some time for me to accomplish this task. Or use your intelligence and physical prowess as suits the occasion, and save Sita from any danger that might threaten her while I am away". 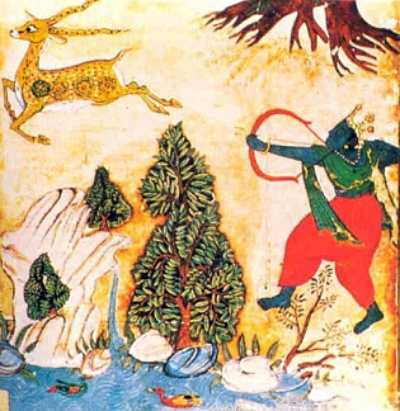 Rama then stalked the strange deer and went beyond sight. The deer did not cast its looks forward, but, ran fast with its head bent backwards, its eyes cast on Rama, the pursuer! Seeing this behaviour, Rama was delighted. Rama knew that the deer was Maricha himself, his great devotee who had experienced and realized the Rama Principle and the Rama Power. So Rama too fixed his eyes on the deer and followed its gait with great interest. The deer came within reach one moment, but it sprang afar with one leap, to attract Rama to a little more distance. Rama seemed to be enjoying this tantalizing pursuit. But, after some time spent thus, Rama fitted an arrow on his bow and aiming at the deer he released it straight on the target. When the fatal arrow struck him, Maricha exclaimed in agony, "Ha! Sita! Ha! Lakshmana! ", and collapsed on the ground. The cry fell on the ears of Sita and Lakshmana. Even before the sound reached him, Sita said, "Lakshmana! Did you hear? That is the voice of your brother. He is calling you for help. Go, go immediately; do not delay. These Rakshasas are experts in magical transformations and tricks. They cause profuse calamities, changing their shapes and natures." She wanted that Lakshmana should proceed in haste to the spot from which the cry had come. Lakshmana was an intelligent person, used to discriminating and arriving at right conclusions. He was also a loyal adherent of the directions of his brother; he revered those orders, precious as his own breath. So, he said, "Mother! No calamity can ever happen to Rama. No Rakshasa, however crafty, can harm Rama. You have seen, haven't you, how he destroyed in a trice thousands of these very Rakshasas? Do not be anxious; muster courage and be calm. Rama will soon come back hale and hearty into this hermitage. Just then, the cry came again across the distance: "Ha! Sita! Ha! Lakshmana! "; at this, Sita was even more agitated and confused. She said, "Lakshmana! Why is it that you are behaving so heartlessly? I do not understand your intentions. Go soon. Go and put an end to the danger into which your brother has fallen. Help him; go". She demonstrated her fear and anxiety in many ways and tried her best to persuade Lakshmana to leave her. Of course, Sita knew quite well that Rama can never be touched by trouble. But, things have to happen as foundations for future events. She acted like an ignorant person affected by the cries. Lakshmana spoke assuringly in various ways; he pleaded piteously that he would not disobey his brother. Seeing that she cast aside all his arguments and appeals, Lakshmana said at last, "Mother! The Command of Rama is my very Life; I consider it as precious as my breath. Did you not hear Rama ordering me never to leave you unguarded, but always to protect you? Therefore, I shall not move one step away from here, whatever might happen." Sita desired that Lakshmana be sent afar, for Ravana had to approach the hermitage; it was the plan that Rama had designed to effect the destruction of Ravana and the Rakshasas. She had to fulfill the will of Rama. So she too held on to her words and made them sharper and more hurting, so that Lakshmana could yield. Lakshmana closed his ears with the palms; he could not bear the imputations and the charges. He prayed, "Mother! I shall suffer all the anger you pour on me." But, when Sita became harsher and threatened to go herself to the rescue of Rama if he would not proceed, Lakshmana had no alternative. He could bear it no longer. He could not allow her to roam about in the forest in order to discover Rama and help him. So, with a heavy heart, he moved away from the hermitage in search of Rama. When Lakshmana left the hermitage, he pleaded with Sita to enter the place and be within closed doors, and never to move out. He exhorted her to be careful and vigilant. He moved out of the hermitage, with no willingness and with no strength to move! He turned round and addressed the spirits of the forest, praying to them to keep watch over Sita and guard her. He drew four lines around the hermitage and invoking on them mysterious and mighty mantric power, he asked Sita not to step beyond them on any account, under any pretext or pressure. Lakshmana was a person endowed with all the virtues; he was caught between loyalties to two divergent commands; he could not disobey either; so, he was overcome with anguish. He had perforce to act counter to the commands of Rama; he had to leave Sita alone and unprotected. Fear shook his heart. He walked off, in spite of his legs failing him; he turned back towards the hermitage, at every step he took forward. At that very moment, Ravana was transforming himself in appearance and apparel, for, he was awaiting just this chance. He became in outer form a Rishi; but, his intention, in spite of his innate power to terrify by his very name both gods and demons, was to steal like a sly dog. Casting his eyes all around him, he entered the hermitage, surreptitiously, with a trembling heart. When he attempted to enter by the front door, the mystic lines that Lakshmana had drawn across seemed to raise tongues of fire at him. He feared that his plan might fail and that something even worse might happen to him. So, he stood beyond the line, and shouted, "Mistress of the House! Give me some alms". Sita heard the cry; she knew that it was Ravana. She brought tubers and fruits in her palms, and came through the door and stood outside. But Ravana dared not go near her to receive them. He said, "I shall not come close to any hermitage; this is my vow." He wanted that Sita offer the alms into his hand. Sita replied, "No, I cannot cross the line that was drawn by my brother-in-law. Come yourself, revered guest! Receive it from me, here." At this, the mendicant who was really an impersonification, urged, "Lady! I will not cross the line and come beyond it. Nor can I accept alms given from beyond a line. It is not proper for ascetics like me. Come. Give it to me, I am hungry; I am very hungry." He acted the part so well, with many a gasp and gesture, that Sita decided to give him the alms she had in her hand, crossing the line and getting near him. All this happened in a trice. No sooner did she cross the line than Ravana drew her by the hand and lifted her away into a waiting chariot; he did not pay heed to her lamentations, but drove the chariot into the distance with terrible speed. Sita screamed out, "O Rama! Lakshmana! Come and save me from the wicked monster." The anchorites and forest-dwellers around Panchavati heard the cry but could not save the person who lamented. The entire forest faded green to brown, when the voice of agony passed through it. "O Rama! O Master! Save me; O Save!" "Save me from this monster!" that was the cry that reverberated in the forest and made all things that move and do not move, sorrow-stricken. Sita was admonishing Ravana inside the chariot. "Ravana! You are building a royal road for your own destruction. You are effacing your empire, your subjects, your dynasty, completely, without trace. You are perpetrating this vileness with a laugh on your face; but, the day will come when you will pay for it with tears in your eyes. Mean wretch! This vicious act is unbecoming of a person who has practiced austerities like you." She gave him many a piece of advice and warning; she also called upon Rama and Lakshmana to rescue her. The monarch of eagles, Jatayu, heard the plaintive cries that rose from that moving chariot. He recognized the voice as that of Sita. [See also: Ramakatha Rasavahini-2, Chapter 1] He realized that Sita was in the chariot of Ravana. He grieved over his age, which made him too weak to fight Ravana, the villain who was taking her away. He felt that it would be wrong not to hinder him. He knew that no act of service can be nobler than rescuing a woman from the clutches of a fellow who was kidnapping her from her lord and master. He resolved to sacrifice his life, if need be, for the holy act of saving Sita from the demonic grasp, and using all his energy and skill for that act of service. Circling overhead, Jatayu shouted, "O Sita! Have no fear, I shall destroy this cruel villain and release you. I shall place you in the Presence of Rama." He flew across the chariot's path, and hit Ravana many times with his sharp beak, causing him to bleed profusely; he beat the chariot with his wings and attempted to stop it by creating a terrific wind that would retard its speed. Even while on his wings, he gave Ravana excellent advice to correct himself, before it was too late. "Ravana! This is a step that would bring you no good. Release Sita and go safely home. Or else, like moths that fall into fire, you and your brood will be burnt in the fire of Rama's anger. Your pride will cause your total ruin. To kidnap another's wife is a heinous sin. Only a sinful heart will yearn for another's wife and wander in search of her. Only base brutes, worse than dogs or foxes, will descend to such depths. You are acting like one who is so mad that he cannot pay heed to what is in store for him. Consider, is there a more barbarous crime than this? O! What a sin have your parents done to be claiming you as their son? Your head has turned because you reckon on your physical strength, your riches and the peoples under your control. But, listen, all these will go up in flames and be reduced to ashes. Even the powers you have achieved through your austerities will be destroyed in a trice. Will you remain calm and inactive, when your wives are carried away or coveted by other Rakshasas? In fact, those who respect women, both those who are their wives and those who are not, will never invite this dread misfortune on their heads". Uttering these words of golden advice, Jatayu flew along with the speeding chariot for some distance, Sita derived great consolation listening to the words of Jatayu. She was comforted when she heard these sentiments so well expressed. Jatayu succeeded in stopping the chariot and forcing Ravana to engage in battle with him, after making Sita dismount and helping her to sit under a tree. But, age took its toll; he could not fight for long; he was overcome soon. But he was able, during the fight, to pull down the crown from his head, and pluck a few bunches of hair. He pecked at his body so fiercely in so many places that he was turned into a mass of bleeding flesh. Jatayu's beak and widespread wings hurt Ravana a great deal and humbled his pride. As a last resort, Ravana drew his wheelsword, and with its sharp edge, he cut off the wings of Jatayu, felling him helpless on the ground. Wings are as the very breath to eagles. So, he cried out in his agony the name of Rama and fell on the ground. "I fought, with no reservations, in the cause of my Master; but, my struggle was of no avail. This too is the will of Rama. Rama must have planned all this, in order to confer some benefit on the world. Or else, can Sita be taken away by force by any one, without His will designing the act? I have now only one prayer to Him. I must hold my breath at least until I meet Him and am able to convey this news to Him. I have nothing greater to do in this life." So saying, He closed his eyes and was lost in prayer. Meanwhile, Ravana had placed Sita again in the chariot, and started off in great haste and with much commotion. 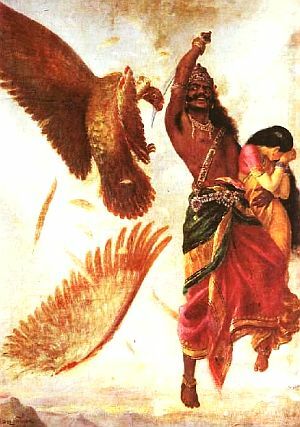 Jatayu saw him moving past; he heard Sita crying out for help. Jatayu was sunk in anguish that he could not offer further resistance; he lay in a pool of his own tears, his heart yearning for Rama and his tongue whispering His Name. "When death draws near, when calamity is a few steps off, nature behaves in an unexpected manner to warn and teach. Things behave topsy-turvy. This Ravana too, is behaving in this manner, since his end is near, and his kith and kin are about to be wiped off the face of the earth." Jatayu realized this truth and lay there, keeping himself alive by his own will, awaiting the approach of Rama. The picture on this page is by Raja Ravi Varma.